A Study on the Juvenile Idiopathic Arthritis (JIA) Profile in the Indian Children with Reference to the Revised Durban Classification (1997):- Studies in Indian Juvenile Arthritis are sparse. The earlier classification criteria of JIA have been inadequate and the newer proposed Durban Classification criteria have not been validated in Indian patients. Hence a study has been undertaken by Center for Rheumatic Diseases to validate the revised Durban Classification criteria in the Indian children. Till date over 450 children suffering from different forms of arthritis have been evaluated. The database is under analysis. 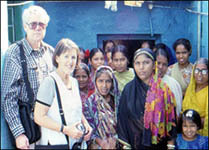 Dr. Ross Petty, MD, University of Columbia, a renowned Pediatric Rheumatologist, visited CRD on 4th Nov 2005. 62 JIA children were evaluated by him at a free of cost arthritis camp held during the day. Dr. Ross Petty discussed & answered number of queries raised by JIA patients and their relatives during the 'Meet the Patients' session. The session lasted for 3 hrs. A fun fair was also organised for the JIA children with a magic show, tattoo making and various games. Dr. Ross Petty appreciated the work done by CRD in the field of JIA. Association of HLA-DRB1 with Rheumatoid Arthritis (RA) in family Studies:- Familial aggregation of RA & its association with HLA-DRB1 alleles is being studied in families where more than 1 degree relatives are being affected with the disease. In Bhigwan COPCORD study, one such family is being followed where the disease has affected 3 generations; more than 8 members in the family have RA. A strong association with the HLA-DRB1 * 010 has been observed in this family. ?